Fernie Alpine Resort provides visitors legendary powder, uncrowded trails, mild climate, the best in Après ski fun and much more! Delivering over 2500 acres of skiable terrain, 142 named runs, 5 alpine bowls, and an exceptional beginner’s area, Fernie is a true winter playground for skiers and riders of all levels. 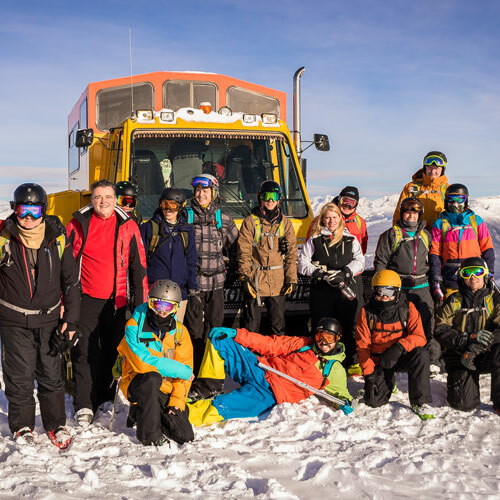 MagicBus launches a weekender trip to Fernie every year during “Griz Days” which offers many family friendly events both on and off mountain. Last year’s events included Dummy Downhill racing, live entertainment, downtown parade, fireworks, and more. Base at 3450 feet, top at 7000, but really it’s about the snow. And this place gets lots of snow!! Imagine snow deep enough that you could bury a bus in the snow bank! Yeah, that kind of snow. There are 142 runs here with a full 70% for blue and green skiers. Fernie is friendly and spectacular! The remaining 30% of expert runs are truly “expert”. Like most mountain resorts, when they say experts only, they aren’t kidding. You have a great selection of lifts, 2 speedy quads, 2 relaxy quads, 3 triple chairs and various beginner areas. This area offers the perfect combination of runs for schools, families, company getaways to full on max effort training. Beginners to experts are all happy at Fernie Mountain resort. For the beginners in the group Fernie offers some great warmup spots with The Moose lifts, the Mini and Mighty Moose lifts are perfect for the newbies. Gentle, and comfortable slopes with confidence building terrain. Once you’re comfy head up to the Deer and Elk Chairs. These feature several awesome green and blue runs with lots of selection. These are wide open, super comfy cruisers that all feed to the base area. There are enough to keep you interested and busy for quite a while. Ready for more? Head up the Great Bear Express Quad Chair, accessible from either the Elk or Deer Chairs, better from the Elk chair though. Upper runs tend toward the blue class of terrain, if this meets your needs be ready because there’s tons to choose from up here. The Lizard Bowl is spectacular for all types of skiers/boarders. You will find at least one favourite Fernie runs in here. Be sure to hit the Boomerang Triple while on this side. This chair feeds you into several heart pumping black and double black runs that will ramp up the beats per minute and prime your appetite for the Timber Bowl. The Timber Bowl Express Quad hauls you way up into the alpine, this chair is all black and blue so come prepared. Three giant bowls, Currie, Timber and Sierra await the enthusiastic skier/boarder. From wide open rippers to chutes to bumps to spines… it’s all here! Bring fresh knees and a trail map and have a great day! Well, when you’re done and the gear is in the rack, it’s time to eat! Fernie has lots to choose from right on mountain. Friendly pub style to family restaurant, the full selection awaits. Fernie is for everyone. Come excited, leave happy! The Park Place Lodge is a locally owned, independent hotel that provides distinctive lodging in the heart of town. With 64 modern guest rooms and the usual amenities including an indoor hot tub and pool, the Park Place lodge prides itself with providing superior guest comfort and memorable dining experiences.